I didn’t realize for most of my life that God gave me larger than normal eyes. Opticians tell us that most human eyes are 22-23 millimeters in length. That’s measuring front to back. During the past year the doctors told me my right eye was 28.3 millimeters long and my left was 27.6. They also told me that this was the main reason I was nearsighted. Large, oval eyes, are prone to not seeing well. Thus, for all of my life I was legally blind. Fortunately, I lived in the latter part of the 20th century where glasses were a good option (though years ago they would have been as thick as Coke bottles for me) and especially contact lenses. When I was ten years old, contacts were becoming popular and three members of our family received them gladly–my mom, older brother, and I. My eyes were the worst (biggest) of the bunch, but we all needed help. So, at a very early age I learned to pop them in and make them part of my life. For over fifty years I wore them successfully. Praise God. If it weren’t for contacts, my athletic life would have been much different. And if I’d been born before the 14th century (when spectacles were invented) I might have been a dunce sitting in a corner. At least I would have faced a major handicap to overcome. In January, I bit the bullet, took out my contact lenses for the last time and went to glasses. For the first two weeks I experienced headaches and double vision (not good for driving). Then after receiving new lenses because my eyes had already flattened, things evened out and I lived in the glasses world for three months. I think “glasses people” are a little more humble than others. They are constantly aware of a contraption on their noses that limits side vision and every place where the metal or plastic is in view. When it rains, the lenses get wet. When you go from hot to cold, they steam up. Never had those problems with contacts. The sky was big and blue and there were no limits (except losing them). So, I guess having the limitation of glasses is a greater reminder of fallen humanity. Three months dragged by and the time came for surgery. My optometrist referred me to Pacific Cataract and Laser Institute. They worked out of fourteen clinics on the west coast from Alaska to New Mexico. One was thirty minutes from home. Their literature stated that cataract surgery was one of the most common and successful procedures in the world. They’d helped pioneer some of the newer techniques, and by 2017, had performed hundreds of thousands of surgeries. I wanted that “helping hand” too. For fifteen years I fixed that problem with two different contact prescriptions. It worked great for me, especially since I speak for a living. Now I was being told that because of my long eyes, they had to use more complicated formulas for the lens implants–and I probably would still have to wear glasses or contacts to read. I prepared myself for that reality, but asked friends to pray. After all, God knew the exact “formula” needed and could show the doctors. On April 13, I went in for the first eye. They scheduled thirty patients that day and we all sat in a room taking turns getting our eyes dilated, then half of our face deadened. Finally, it was time for surgery and I went into the operating room. I couldn’t feel anything in my right eye–didn’t even know whether it was open or closed. Dr. David Gano went to work after leading the room in prayer. First he used an small ultra-sound tool to break up the cataract (hardened) lens I’d been born with. It’s located behind the cornea. Then he used another instrument to vacuum out the pieces. Finally, he made a small slit and inserted the new acrylic lens. (What revolutionized cataract surgery seventy years ago was noticing that WWII pilots who suffered broken glass in their eyes didn’t react to the shrapnel. It didn’t bother the eye. That changed the ball-game.) Then Dr. Gano unfolded the new lens, anchored it to the surrounding sack with acrylic “ties”, washed out the eye, and said he was done. The whole procedure took all of six minutes. Afterwards, they gave me a video of the surgery and sent me home with a patch. Within 18 hours, the vision in the right eye cleared to 20/20. God had shown them the right formula. I could see perfectly in my right eye for the first time in my life. The person who deadened my eye that day had performed the very first surgery with PCLI some 32 years before. She told me she had done more procedures of this type than any person in America. I felt very secure in her care. But I was also depending on the Great Physician. This time Dr. Paul Chung was my surgeon. He laid hands on my head and prayed for God’s blessing. During the six minute operation, he told me that he’d done five missionary trips to North Korea, doing many surgeries there. We talked about missions the entire time. What a great way to have repairs done. Then I went home with my second video, eye drops, and great expectations. Within three hours, the left eye opened but everything was “slanted.” Then the fuzziness and double vision began to wear off. After sleeping through the night, when I woke up on April 21, I noticed that I could read the alarm clock from bed for the first time in my life. Jumping up, I realized I could read easily in one eye and see the room perfectly with the other. They had done it. They’d corrected Mr. Big Eyes with exact precision. I felt like a 20-year old again who could clearly see the street signs but also read my cell phone. And for the first time in my life, I didn’t “take my eyes out” that night before going to bed and ask Shirley to guard the house against burglars (because I couldn’t see). Fifty years ago, I was also spiritually blind. 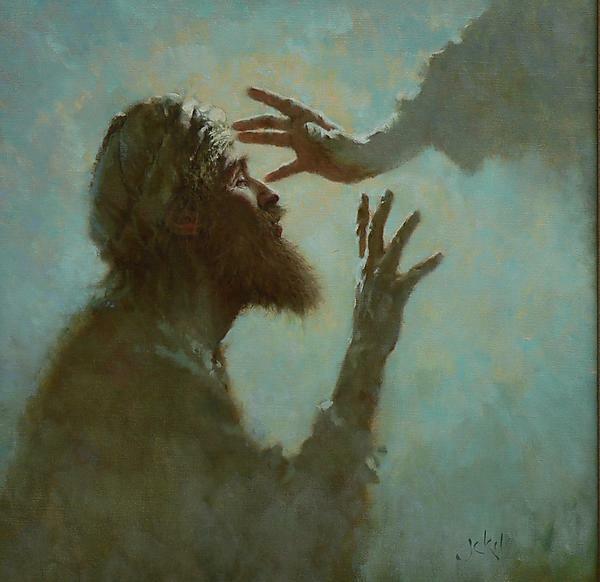 I remember the day that Jesus my Savior, the truly Great Physician, removed my spiritual cataracts and revealed his love and grace. Light poured into my life that has never dimmed. I can see long–heaven. And I can see close up–earth. That surgery saved my soul. This most recent one saved my eyes. Vision is a gift we must never take for granted. Without spiritual and physical vision, the world would be depressingly dark. But God gives sight to those who trust Him. His work is instantaneous. He never makes a mistake. I’m deeply grateful for the gift of sight. Nice to know there's company in blessing. !My hips are doing great (after 13 and 10 years respectively). I'm in DC right now and about to attend the main parts of the National Day of Prayer. God is doing some good things in our nation. Rejoicing with you Ron in your new vision! That is so awesome….God is awesome! Praise God!!! I hope for the same! How is your hip coming along?